The race for the Big Sky Player of the Year is open. Will Cherry was the presumed winner heading into the year... but after missing most of the non-conference slate as well as the end of the conference season, he should not win the award. He is the best player when healthy, but it's hard to overlook the injuries. So that begs the question... who could or should it be? Why he deserves it: When he is on his game, there is nobody like him in the Big Sky. This year he has shot 52.5% on twos and 38% on threes. He gets to the FT line better than almost anyone in the conference (50.0 FT rate). He is also Montana's best rebounder (16.9 DR%), best passer (25.7 ARate), and arguably the best offensive post player in the conference. He also has helped lead them to a 17-1 record even as Montana has dealt with injury issues. 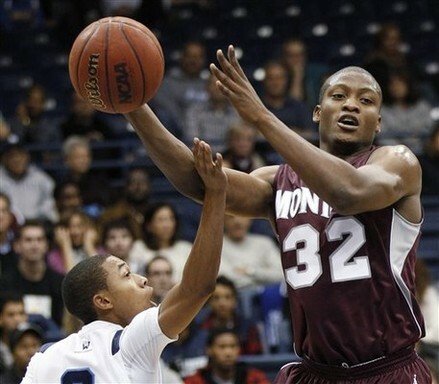 Why he doesn't deserve it: He does a lot of things... but his 13.3 PPG are 14th in the Big Sky during conference play. He also doesn't crack the top ten in rebounds, and is eighth in assists. Sometimes the counting stats get a lot of weight. If they do here, Jamar may come up short. Why he deserves it: He is the best rebounder in the Big Sky, and has gotten better and better as the season has gone on. In conference play he is averaging 14.8 PPG (8th) and 9.9 RPG (1st), while also shooting 57%. He does a lot of his offensive work on offensive rebounds, an area he is very strong. He might be the biggest matchup problem in the Big Sky. Really, he is only 6'3'', but he is the best rebounder in the conference right now. He is also an underrated defender. Why he doesn't deserve it: He is a good offensive player, but not a great one, and sometimes is more complementary than the main weapon for UNC on that side of the ball. He shoots 66% from the FT line, and is not a great passer. Why he deserves it: In conference play he is fifth in scoring at 16.1 PPG, sixth in assists at 3.9 per (fourth in A:TO ratio), and leads the conference shooting 49.3% on threes. He does everything well, and always seems to find a way to contribute. He takes great care of the ball. He is also a really good defender at the three spot, with athleticism and smarts at that position. Why he doesn't deserve it: He is not as good of a rebounder as some of the other candidates. If you compare him to someone like Jamar, you would say they are both good scorers, but Jamar is a better rebounder and probably a better passer. Why he deserves it: His ORtg of 126.9 is 17th in the country and first in the Big Sky. He does so much for Weber State he might be one of the more underrated players in the Big Sky. He shoots 44% from threes and 89% on FTs. He is a good passer and takes very good care of the ball. He is also a crafty defender on the outside, an area of his game he doesn't really get a lot of recognition in. Why he doesn't deserve it: He doesn't score a ton (just over 13 PPG during conference play) which might lose him some votes, since some may see him as a product of a really good Weber State team. While he is a good passer ballhandler, he doesn't get many assists. He might get the perception of being an undersized two guard who is an elite shooter but not great in any other area. Not fair, but that could be how he is labeled. Why he deserves it: During Big Sky play, he is second in the conference in scoring (20.0 PPG) and fifth in rebounds (6.9 per game). On the other side of the ball, he is tied for the lead in steals with 2.4 per game. In some ways he carries the offense (his % of shots is fifth most in the country), and he is battling with Barden for the title of the most athletic guy in the Big Sky. He has a really low TO rate for someone that has the ball as much as he does it. He has also gotten better shooting from the outside. Why he doesn't deserve it: His counting stats are impressive, but you could argue they are inflated a bit due to the high number of shots he takes. He is only a 68% FT shooter, and doesn't get many assists compared to guys like Jamar and Berry. Also, he missed all of the non-conference slate and the start of the conference season due to injury. Why he deserves it: He is efficient offensively, shooting 50% on twos and 89% on FTs. He is third in the conference in scoring during Big Sky play at 19.7 per game, and second overall at 17.8. Like others, he takes care of the ball even though he has it a lot. He is one of the best offensive players in the conference. Why he doesn't deserve it: He is a good, but not great rebounder. He is not a great three-point shooter, and shot just 31% there on 67 attempts. He is only an average defender. After a strong start, SUU has struggled in the second half of conference play. EDIT: After hearing some arguments, I am willing to concede that I might be criminally underrating Davion Berry, and he should be in the top 3. That is why this is subject to change! I would really love to hear thoughts on this, since it is such a wide open race! Let me hear them!! When do they announce the awards and all-conference honors? Next years Big Sky POY should be a great race too because of Jamar, Barden, Huff, Berry, Jois. For me it's a two man race between Jamar and Berry. When you consider that no one separates themselves statistically you can only award Berry or Jamar. You mention Berry's rebounding rate but fail to mention that Weber shots the highest percentage in ALL of College basketball. You cant fault him for having the least opportunities. Also confused on the assist comment you said Berry leads Weber in scoring and assist and has the 4th best turnover ratio but you gave Jamar the nod as the better passer? Jamar has had an amazing year and literally does it all. What he brings to the table is far more valuable than what a player like Huff does. team. He would need to improve his efficiency for my vote. 20pts a game is impressive but he's taking nearly 20 shots to get there. On the fence about Barden. Impressive stats but like Huff he's on a mediocre team. I'm not sure Berry has quite the NBA potential that Lillard does... but after evaluating things since this article was posted, I do agree with you guys that it is a two man race between Berry and Jamar. Both are really suburb.